If you want a facility that allows your horse to just be a horse, then Poco-Razz Farm is the place for you. 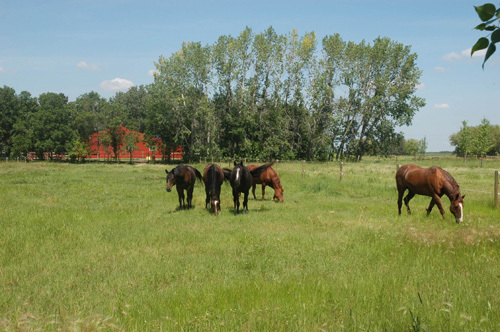 If you want a facility that allows your horse to graze on excellent forage, exercise at will, make friends, and enjoy the benefits of a herd, then Poco-Razz Farm is the place for you. If you want a facility close to the city, run by experienced, well trained staff with outstanding managerial supervision by on-site owners, then Poco-Razz Farm is the place for you. If you want a facility that allows you to ride your horse in a professionally installed outdoor riding arena or train your horse in a round-pen, then Poco-Razz Farm is the place for you. If you want a facility with miles of trails adjacent to its location, then Poco-Razz Farm is the place for you. If you want a facility where the care and maintenance of your horse is the primary consideration of the owners, then Poco-Razz Farm is the place for you. If you want a facility that allows you to care for your horse while your horse is being cared for, then Poco-Razz Farm is the place for you. If you want to spend less money on gas to get to your horse and have more time to spend with your horse, then Poco-Razz Farm is the place for you. If you want a friendly stable where the boarders go on trail rides for fun and friendship, then Poco-Razz Farm is the place for you. Give us a call and come for a visit. We would be happy to show you our facilities. "We are Jim and Christina Shapiro, owners and operators of Poco-Razz Farm since 1982. We named our farm after our first two horses, Poco and Razz. Our motto is "Your Horse, Well Cared For." We live on the farm, which allows us to continually monitor the horses. Jim is a professor at the University of Manitoba specializing in animal behaviour." 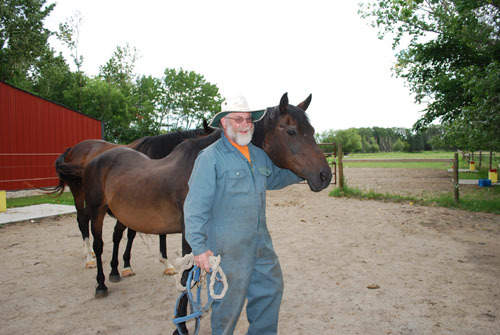 "At Poco-Razz Farm, the horses are maintained as a herd and rotated through eight different pastures. We have combined the best practices associated with indoor and outdoor boarding. The horses are kept out of the wind and are sheltered by 5500 square feet of covered shelter. All of the advantages of the horse’s natural environment are provided for them. The disadvantages of indoor board have been eliminated. The horses are healthy, calm when owners want to work with them and, judging by their behaviour, happy." Our pastures have no debris in them, lots of natural shelter and plenty of shade. The pastures are harrowed to prevent manure build-up and to reduce parasites. Automatic stainless steel waterers provide access to water at all times in all weather. Water temperature is kept at 12.2 degrees Celsius or 54 degrees Fahrenheit in the winter. We have a beautiful tack room for 24 riders and a separate restroom/change room. We provide a place where your horse can roam and you can ride. Visitors are permitted but are not allowed to touch, feed, or handle any horse without the horse's owner being present. Ample parking is available in designated parking areas. We do not accept stallions, ponies, or heavy horses. We accept horses of all ages but reserve the right to ask an owner to remove his/her horse if that horse is not fitting into the herd in an acceptable manner. All new horses are quarantined for two weeks. Give us a call and come for a visit. We would love to give you a tour of our facility. © Copyright 2019 Poco-Razz Farm All Rights Reserved.